The cliché ‘tough times don’t last, tough people do’ aptly describes the odyssey of singer, Slimcase, born Oluwafemi Oke-Eko through the stormy seas of the music industry. For eight years nothing of note was heard of the Ikorodu-born singer, until some seven months ago when the tides turned for him. In the last seven months he is perhaps the most featured singer by other musical acts. The secret is simple. Slimcase, a.k.a Otunba Lamba resorted to the gritty part of the street where he belongs, weaving its pros and cons, to create a recipe of his own which has stood him out. He might have met bigger boys on the street, doing bigger things on the scene but Slimcase found his place and hoisted a flag that has since been flying with pomp and pride. 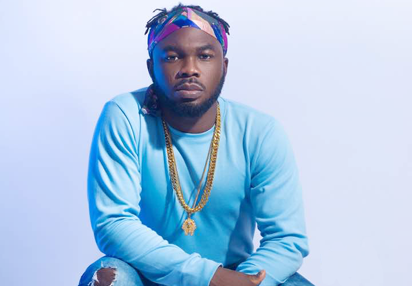 Long before he became an article on the scene, the likes of Olamide, Dammy Krane, and others have been ruling the streets with their street vibes and slang but Slimcase maintains his own style of street slangs which he calls lambas and says they are like no other artiste on the scene. He explained it is the reason he had Christened himself Otumba Lamba, saying he’s not the king and challenges anyone who’s king to come forth and declare. “ No one has come out to say he’s the king of the street. I am the one who has come out to say I’m Otunba Lamba and the street accepted it like that because they enjoy my delivery. Street music is about slang (language) and I call my own lamba. If anyone believes he’s king of the street slang, let him come out and say it. By the grace of God all my lambas are created by me. I have never used anyone’s slang or language. I have been accepted through my own style, not sounding like any one. What is unique about me is my lamba and unique sound,” he added. The street dance known as shaku shaku has been around before Slimcase crashed the party and even singers like Dammy Krane and Mr Real did songs to promote the dance but the Otunba Lamba would remind anyone who cares to listen that the wider acceptance of the dance didn’t come about until his back to back collaborations which were all hits. “ Shaku shaku have been for a while but then there was no song to bring it out to mainstream audience. It was my relentless collaborations like Oshozondi and Shepeteri that made people see a platform for the dance. So, I am a vehicle to drive the dance to the world. That’s why my name is tagged on the street song ‘Shakushaku’. Of course my brother, Mr Real dropped his ‘Legbegbe’ song same time as Oshozondi and it all became a hit and we are both tagged with Shaku shaku. But due to my unrelenting features becoming hits back to back, the street now see me as the frontliner,” he declared with some sense of pride. Slimcase might have a point in claiming to be the vehicle of Shaku shaku to the mainstream because in the last seven months he has been hot in demand for collaborations. He hasn’t released a single song of his in almost a year but he has been featured in top hits after hits. Some of them are Oshozondi by DJ Sides featuring Slimcase; Shepeteri by Idowest featuring Slimcase; Diet by DJ Enimoney featuring Slimcase, Tiwa Savage and Reminisce; Issabanger by D’Banj featuring Mr Real and Slimcase; Shempe by DJ Xclusive featuring Slimcase and Mz Kiss. “ I just can’t contain my excitement. He is the one featuring me on his song. To have me feature Wizkid is big but to have Wizkid feature you is bigger. No one in the street right now has hit that target as an artist and it’s a privilege. God bless Star Boi” he quipped. The post I’m the vehicle to drive shaku shaku to the world- Slimcase appeared first on Vanguard News. INSECURITY: A threat to 2019 polls?